Porch Swing Creations: May 2013 Virtual Club Tutorials Available! Today I'm very excited to share the very first projects offered in my Online Virtual Club! The month of May is focusing on projects for Mother's Day and Father's Day, but either project could be easily adapted just by changing the colors and sentiments to fit any occasion! 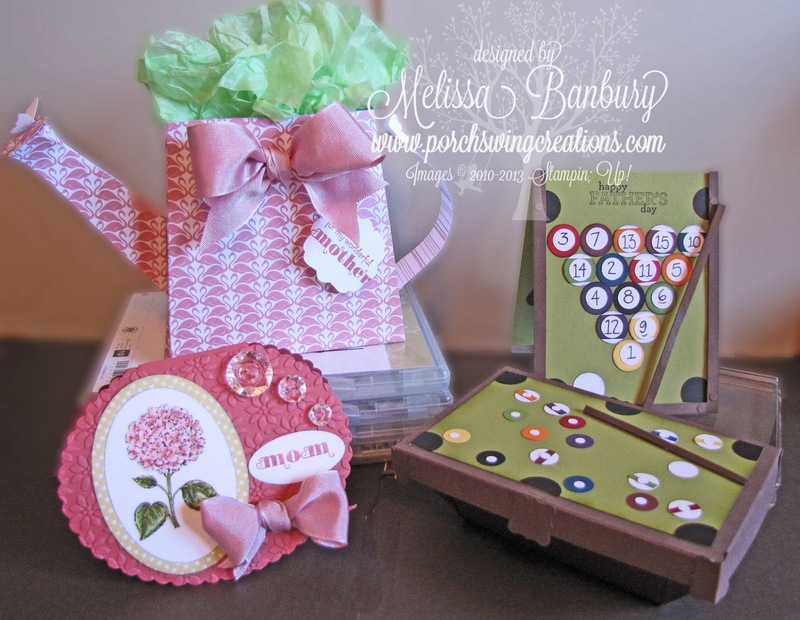 The watering can gift bag is the perfect wrapping for a special gift to Mom, and what Dad wouldn't like to open a Pool Table gift box to find a pair of tickets to his favorite game? This tutorial includes templates, close to 100 photos, and step by step instructions on how to assemble each project, including the greeting cards. Thanks so much for stopping by today! I'd love to hear your thoughts on what you think of my new online venture!